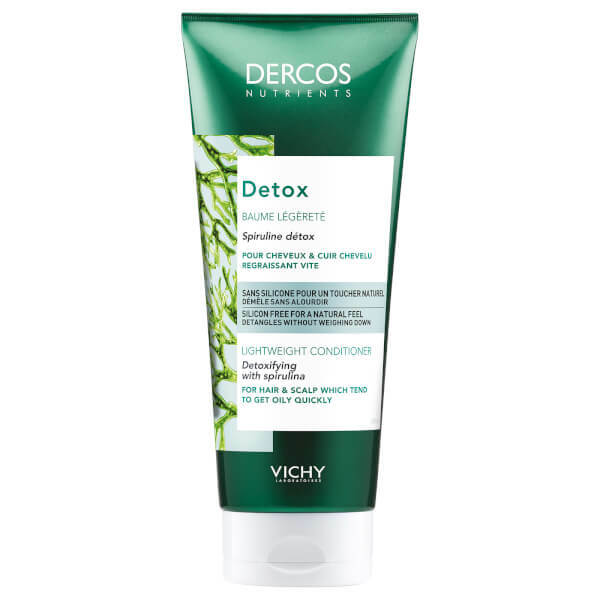 Deeply nourish and protect locks with the Vichy Dercos Nutrients Detox Conditioner; a detoxifying conditioner for greasy hair and scalp aggressed by environmental stressors such as pollution that combats oiliness and addresses scalp help. Enriched with Vichy’s signature thermal water jam-packed with minerals, the lightweight conditioner harnesses the powers of vitamin-rich Spirulina and purifying Charcoal to absorb pollutant particles and shield the hair fibres, respectively. Leaves scalp desensitised and hair with a healthy shine and silky-soft touch. Free from parabens and silicon. Wash hair with an anti-pollution shampoo. We recommend Dercos Nutrients Detox Shampoo. Apply a small amount of Dercos Nutrients Detox Conditioner form roots to ends and leave for a few minutes. Rinse hair thoroughly and towel dry before styling. 1144793 Q Aqua / Water Cetearyl Alcohol Isopropyl Myristate Butylene Glycol Behentrimonium Chloride Glyceryl Stearate Carthamus Tinctorius Seed Oil / Safflower Seed Oil Chlorhexidine Digluconate CI 42090 / Blue 1 CI 47005 / Acid Yellow 3 Citric Acid Dextrin Glycine Soja Oil / Soybean Oil Hydrolized Lupine Protein Isopropyl Alcohol Neohesperidin Dihydrochalcone 2-Oleamido-1 3-Octadecanediol Pentaerythrityl Tetra-Di-T-Butyl Hydroxyhydrocinnamate Sodium Benzoate Sodium Citrate Sodium Phosphate Spirulina Platensis Extract Parfum/ Fragrance Code F.I.L. : C216199/2.